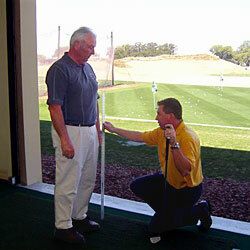 There are many factors involved when measuring a golfer for golf clubs that fit them correctly. We are not all built the same way: tall people/short people, long arms/short arms, fast swings/slow swings, big hands/small hands are a few of the ways that we differ, so how can we all use the same clubs? The answer is we can’t, and that is where we come in! We have all the state of the art equipment for fitting our customers, including a Vector Launch Monitor, the Callaway Opti-Fit System, and the TaylorMade Select-Fit System, as well as being a Titleist Advanced Fitting Center! Fitting Lesson: Conducted by a PGA Instructor, this will incorporate a lesson with the fitting, encouraging a better swing and clubs that fit the changes you are making! Compensation Fitting: Conducted by a certified club fitter, this will entail fitting the clubs to your current swing, to help you gain the best results without changing your swing! Not only do we offer custom fitting, but we have a great selection of demo clubs that one can check out and try. This is a great way to make sure that you like the club before purchasing it!